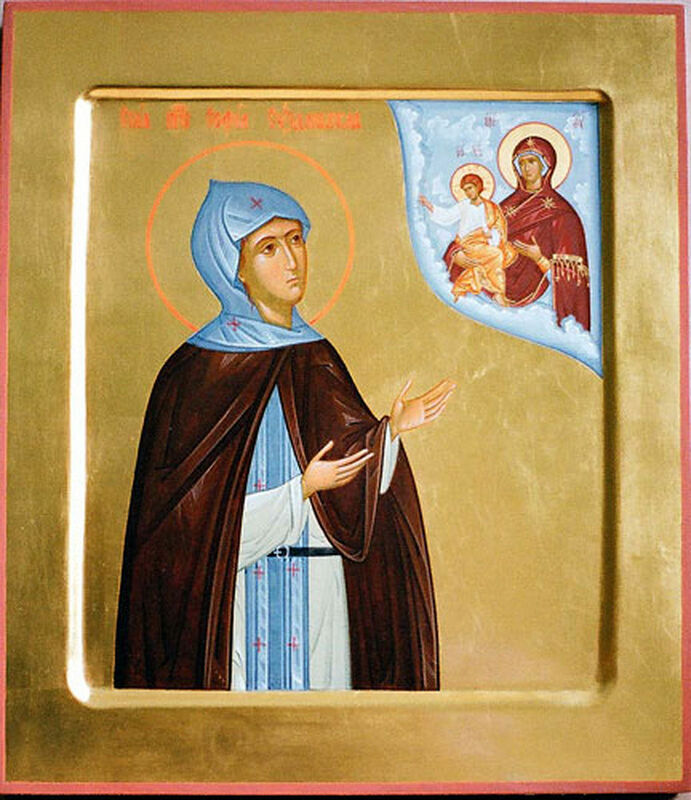 Saint Sophia, in the world Solomonia Yuryevna Saburova, a Great Princess, was born around 1490, the daughter of the noble Yury Konstantinovich Saburov. Her mother died when she was young, and was raised by her aunt Evdokia Ivanovna (sister of her father). In the year 1505 she was chosen as bride by the heir to the throne, the future Great Prince Basil III. She was chosen at the bride's review of 500 girls presented to the court for this purpose from all over the country (modeled on brides for the Roman emperors). The wedding of Solomonia and Basil took place on 4 September 1505, in the presence of the groom's father, Ivan III. 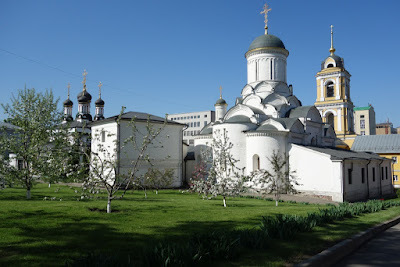 Metropolitan Simon blessed the newlyweds at the Cathedral of the Dormition in the Moscow Kremlin. Her father was thus elevated to boyar upon his daughter's marriage to the monarch. 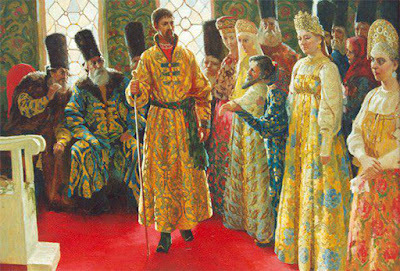 For the first time in Moscow's history, the ruling monarch took as his wife not a foreign princess or a Russian princess, but a bride from the family of the old boyars. After twenty years, it became apparent that Solomonia was barren. Basil perfectly understood that if he died childless his brothers would inherit the throne. In order to preclude this scenario, they were incarcerated or forbidden to marry until his own son was born. In the long term, this led to the extinction of the Rurikid dynasty and to the succession crisis known as the Time of Troubles. Despite her shining beauty, exemplary morals and mild character, Solomonia's failure to beget an heir must have weighed upon Basil's relations with his wife, who turned to foreign doctors for help. 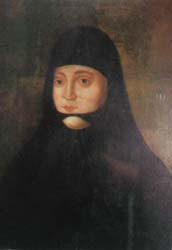 In 1525, the grand prince decided to divorce Solomonia with the approval of Metropolitan Daniel and the boyars, although Vassian Patrikeyev, Maksim Grek, and some other ecclesiastical authorities declared the divorce unlawful. 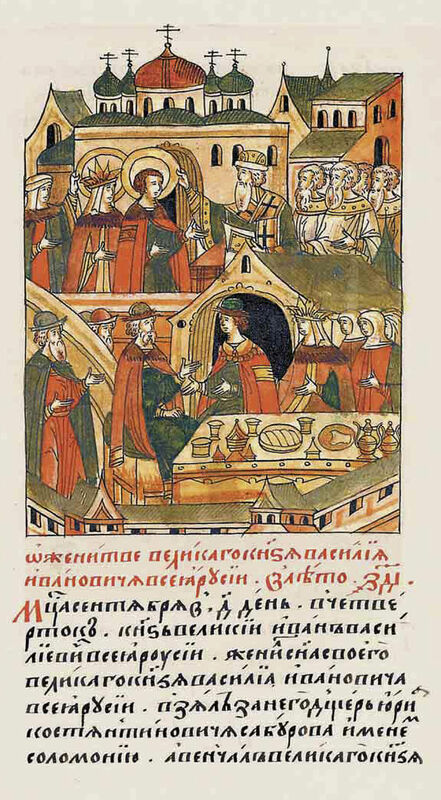 In order to have an heir, Great Prince Basil decided to wed a second time to Elena Glinsky, the daughter of the Lithuanian prince Basil Lvovich Glinsky, and from this marriage Ivan the Terrible was born. And on 25 November 1525 he ordered Solomonia to become a nun. Forcibly tonsured with the name Sophia,* Solomonia was sent under guard to the Nativity Monastery of Moscow. She was then moved to the Protection Monastery in Suzdal, one of the many votive churches commissioned by Basil and his wife in supplication for the birth of an heir. By ascetic deeds she banished from her heart worldly thoughts, and totally dedicated herself to God. 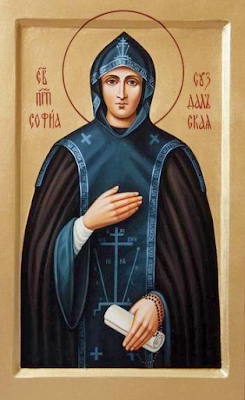 Saint Sophia departed to God in the year 1542 on December 18, after serving as a nun for seventeen years. The rumor about the holiness of the nun quickly spread throughout Russia. 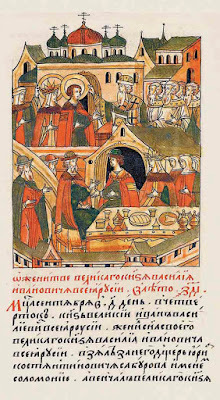 Prince Andrew Kurbsky in a letter to Ivan the Terrible calls the blessed princess “a Monastic Martyr.” In the manuscript of the Lives of the Saints she is called “Holy Venerable Princess Sophia the Nun, the Wonderworker, who Dwelt at the Protection Monastery.” Under Tsar Theodore they revered her as a Saint. 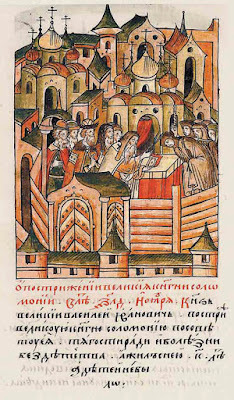 Tsaritsa Irene sent to Suzdal, “to the Great Princess Solomonia, also called Sophia, a velvet veil with depiction of the Savior and other saints.” Patriarch Joseph wrote to Archbishop Serapion of Suzdal about serving Panikhidas and Moliebens for Sophia. 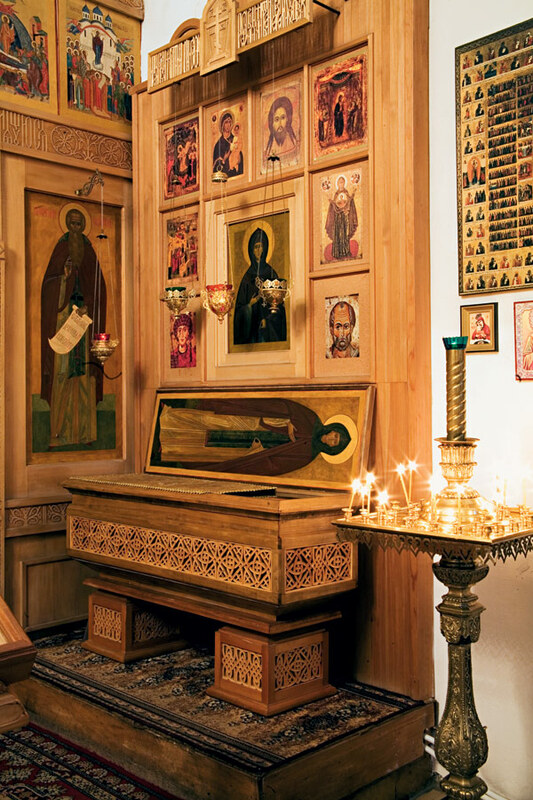 The Suzdal sacristan Ananias speaks of several miraculous healings at her grave. In 1609, during the invasion of the Poles, she saved Suzdal from ruin, appearing in formidable form to the leader of the military detachment of the Poles, Lisovsky. Fear paralyzed his hand, and he swore to leave the city and monastery alone. In 1610 a peasant woman, Theodosia, was healed after suffering with blindness for a year and a half. 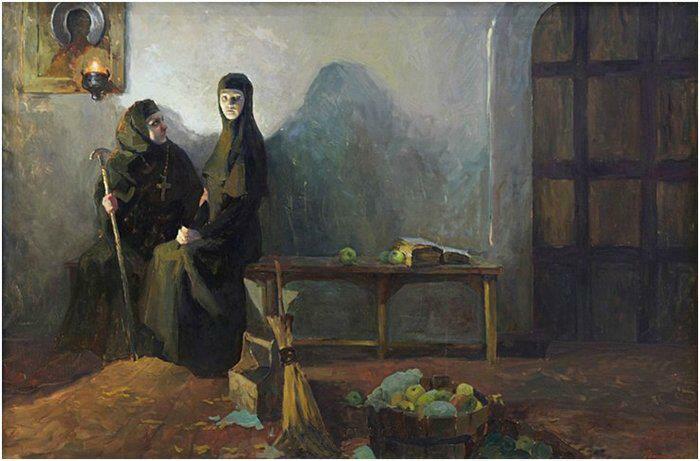 In 1646 a girl, Irina Popova, was healed after being paralyzed for several years. That same summer Juliana was healed of a sort of amnesia. Nun Theodora in 1647 was healed after suffering with blindness for two and a half months. That same year Julitta Ivanova, a resident of the village of Kideksha, was healed after being deaf for two years. 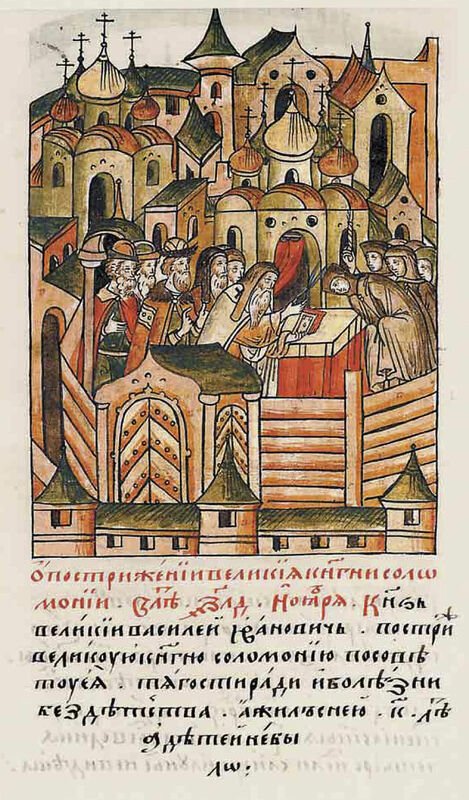 Febronia of Suzdal in 1648 was healed of paralysis after several years. In 1649 a nun of the Protection Monastery, Alexander (Trusov), was healed after losing her sight. Many other healings took place, and continue to take place through her intercessions. 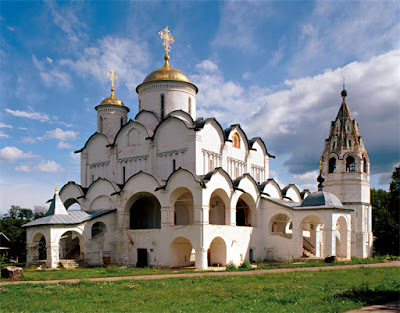 In 1650, Patriarch Joseph allowed the Archbishop of Suzdal to honor her as a Saint. In the middle of the eighteenth century, the question of canonization arose. Her icon, painted in the seventeenth century, has survived to this day and is considered a wonderworking icon. Finally, with the blessing of the Holy Synod, her name was included in the Orthodox Church Calendar in 1916. 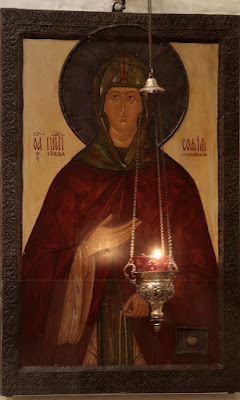 In 1984 by a special decree of Patriarch Pimen she was venerated as a local saint of Vladimir and Suzdal, and in 2007 her veneration extended throughout the Church and she was officially included in the Menaion. The grave of Saint Sophia in the tomb of the Protection Monastery was very revered. On 14 August 1995, the solemn acquisition of her relics took place. 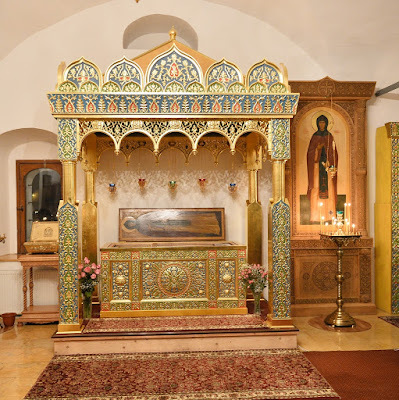 On this day, a moleben was performed over the tomb of Saint Sophia, and the ecclesiological archaeological commission, with the blessing of Metropolitan Evlogy, made excavations - the holy relics were discovered and transferred to the Protection Cathedral. * Sigismund von Herberstein asserts in his Notes on Muscovite Affairs that she was forcefully taken to the convent. He wrote: "Solomonia, it turns out, vigorously resisted tonsure and trampled the monastic robes. Then one of the closest advisors of Basil III, Ivan Shigona, not only expressed to her sharp reprimand, but also hit her with a scourge. After Shigona said that the tonsure is made according to the will of the sovereign, Solomonia reconciled with this fate." 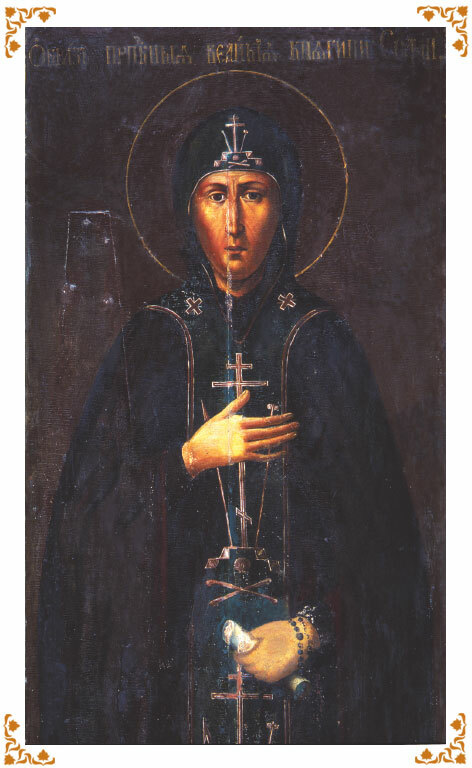 However, the Russian chronicles and Metropolitan Daniel tend to underline Solomonia's submission to the fact that she was barren and sought herself to enter the convent, to which Basil III submitted. There were rumors that Solomonia had given birth to a child named George within the walls of the monastery. 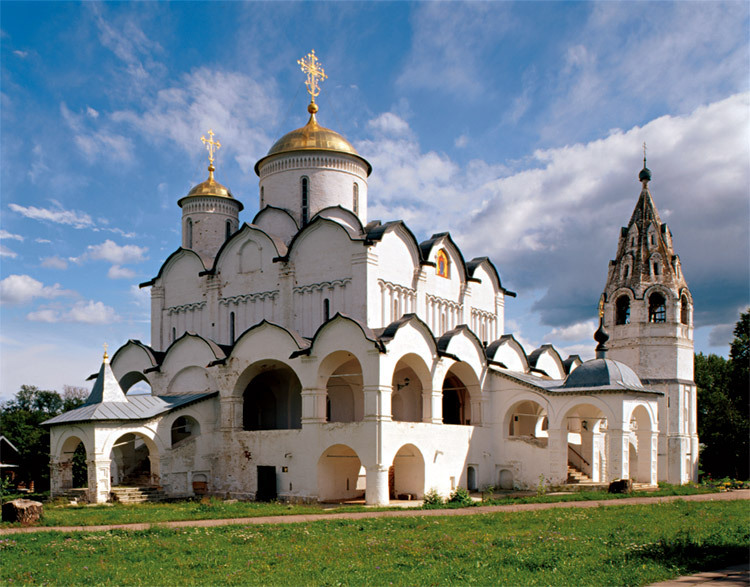 Cathedral of the Nativity of the Theotokos in Suzdal where Saint Sophia was tonsured.